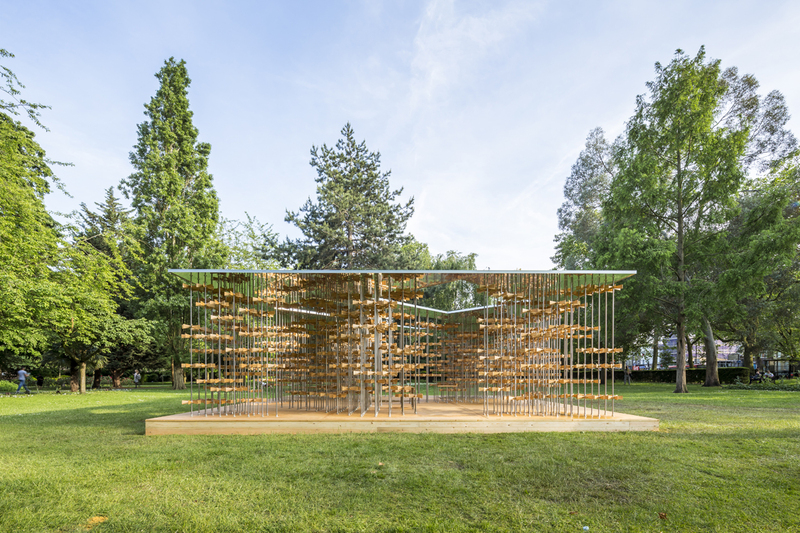 In London's Museum Gardens, outside of the Victoria and Albert Museum of Childhood, the 2016 Triumph Pavilion—designed by Five Line Projects—recently opened to the public. Inspired by the concept of energy, the pavilion is made up of hundreds of pinwheels affixed to stainless steel rods. The pinwheels are aligned so that when one pinwheel rod is turned, an adjacent rod will turn as well, triggering a ripple of movement throughout the structure. An aluminum roof with cutouts creates patches of shade and sunlight within the space.